This engraving by William Daniell was made from an original drawing by Samuel Davis and became plate 1 in their book, 'Views in Bootan'. Davis was a member of the regiment of Captain Turner, which was sent on a deputation to Tibet in 1783 by the Governor General in Bengal, Warren Hastings. Turner wrote an account of his mission, published in 1800, illustrated with a few drawings by Davis. 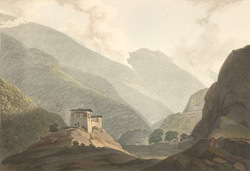 In the fourth stage of their journey into the mountains of Bhutan, the British detachment arrived at Chukha Dzong, "a lofty and spacious edifice, situated on a bare rock, and commanding the passage of the river". To reach the fortress, they crossed Thimphu Chu by the bridge of iron chains on the left side of the view. The fortress itself was composed of three buildings around a courtyard, an excellent defensive structure in a region so difficult to penetrate. After their sojourn here, Turner's group made their ascent of the hill seen in the middle distance. The vegetation changed from the tropical type they had seen in Bengal to fir forests and beds of wild strawberries and roses, and the climate became chilly.